All schools require your child to have a health card certified by a doctor from a government clinic. The process can be intimidating for those who have never done it. Here's a guide on what to expect, what you need to bring with you and where you should go. 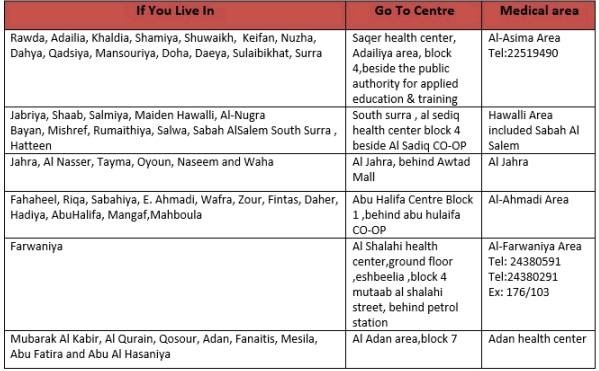 We live in Salwa and so are required to go to the main polyclinic in Salmiya on Salem Al Mubarak Street (next to Sultan Center). Each governorate has a main clinic and you will need to go to that one depending on where you live. At the Salmiya Clinic, we went upstairs to reception to open the file. Then we went around the corner to see the first nurse/doctor who asked family medical history questions and stamped the papers. Then we went downstairs to the second doctor (ground floor pediatrics, room 2) and there a doctor listen to our daughter's chest, asked a few more questions and added a second stamp to the file. Then back upstairs to reception again for a final stamp to complete the file. Took us about 30 minutes in all, but we went early in the morning to avoid a crowd. After the file has all three stamps, you can take it to your child's school nurse. We recommend making a copy of the completed and stamped health file for your own records before you give it to the school. Editor's Note: Government procedures in Kuwait change frequently. This information was updated in September 2014.